Illinois ETA Ron Tutor Jr in concert. All photo used in this article were provided by Ron Tutor, and are credited to Sharon Tutor. Inside ETA Ron Tutor Jr’s hair salon in Orland Park, Illinois. A discussion about Elvis wigs and keeping fit for performances led to some interesting information about today’s featured ETA, Ron Tutor Jr, from Tinley Park, Illinois, USA. Ron, who has been cutting hair for 34 years and owns his own salon, Ron Tutor’s Salon Studios, in Orland Park, IL, cuts and styles his own Elvis wigs. ETA Ron Tutor Jr with his wife, Sharon Tutor, who is also an accomplished singer. Ron started his ETA career a little later in life than some Elvis Tribute Artists, so to keep up with the younger ETAs, Ron works out regularly. On their first date in 1982, Ron and his wife, Sharon, saw “First Blood” (the first Rambo movie) and it inspired Ron to lift weights, which he has been doing ever since. Ron has done very well in competitions. In the video below at Images of the King, Memphis, TN, on August 14th, 2017, Ron is one of five in the Non-Pro finale. In a competition that started with twenty-five competitors, Ron had a fabulous finish. In a recent show, Ron, his father, Ron Tutor Sr, and his 11 year old daughter, Jessa, all performed on one stage—three generations of ETAs! Photos were provided Ron Tutor, with credit to Sharon Tutor. It is my pleasure to introduce ETA Ron Tutor Jr to SIDEBURNS Magazine followers. Thank you, Ron! I started this wonderful Elvis journey about 6 years ago--a very late start, to say the least. I was helping my 70 year old dad with his own Elvis Tribute show! 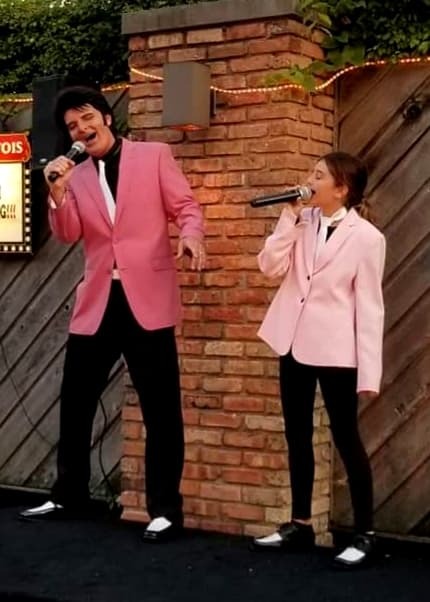 We decided to add a little variety to the show, and I, with no singing experience or background, along with my lovely and talented wife, sang a duet of “Devil in Disguise”. I, of course, nervously stumbled through it, bad wig and all! But I had fun, and thought maybe, just maybe, I could do this. So, very unpolished and scared to death…lol, I entered a small contest at a local casino and won. I was hooked! But at 47 years old, if I really wanted to pursue this, I knew I would have to practice, learn, study, and listen. And that’s what I did. Along the way, I have been lucky enough to accomplish a few things: 2012 Hollywood Casino Elvis Contest, 1st place; 2013 Half Way to Windy City Contest, People’s Choice; 2014 Halfway to Windy City Contest, 3rd place; 2015 Annual Windy City ETA Competition, People’s Choice: 2017 Blue Suede Memories, 1st place Non-Pro; 2017 Images of the King, 5th place Non-Pro); 2018 Blue Suede Memories, 4th place Pro); 2018 My Way ETA Competition, 1st place. But really, my biggest accomplishment is being so blessed in meeting some of the most wonderful people in the world, and making lifelong friends along the way--all because of my Elvis Tribute Artist journey. And really, all because of Elvis! ETA Ron Tutor Jr with his wife, Sharon Tutor. 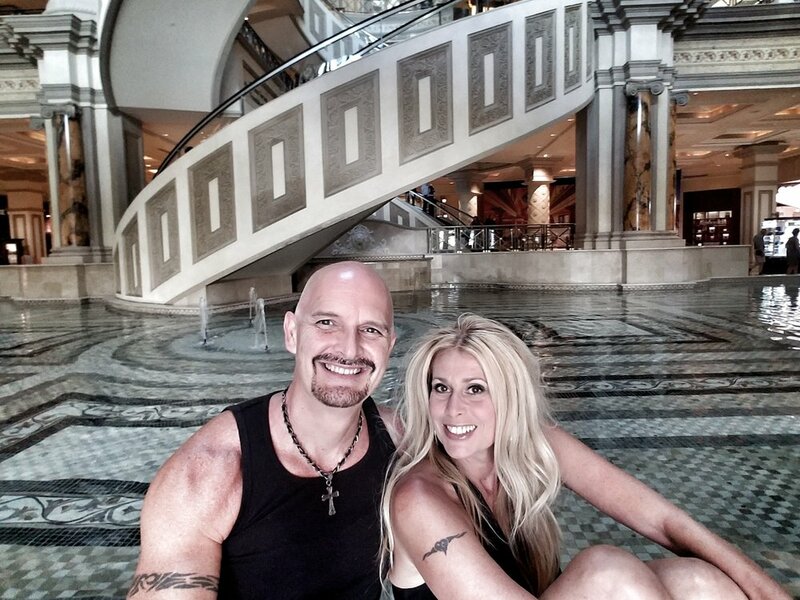 My beautiful wife has been with me every step of the way encouraging and helping me. And we plan on continuing this amazing journey together! We have always told our little girl that she can be anything she wants to be, “Don't doubt yourself.” And there I was 6 years ago, doubting myself, doubting my ability. 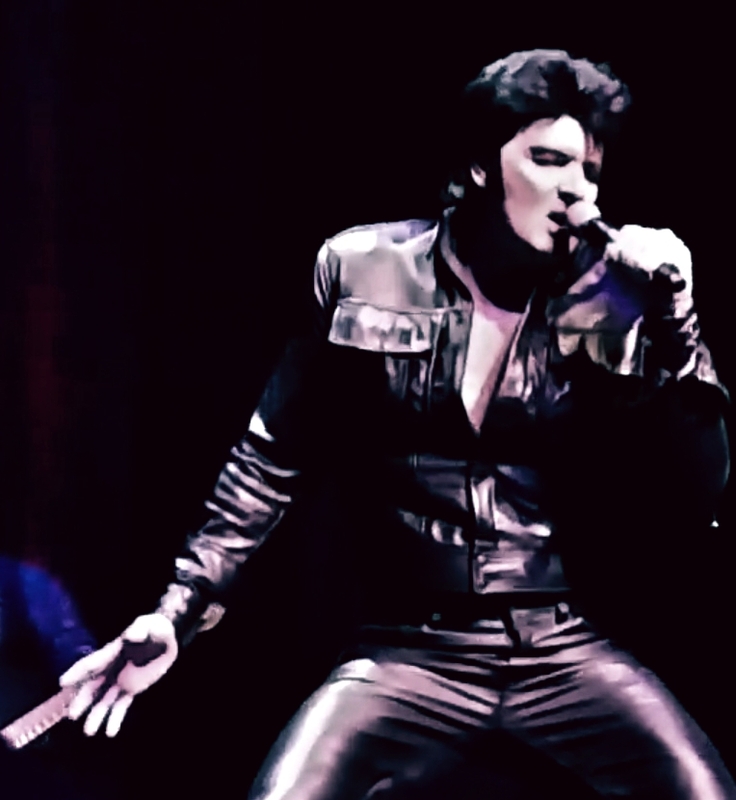 But here I am today, at 53, a part time Elvis Tribute Artist, and loving every moment of the experience! I have a long way to go, but I don't plan on quitting anytime soon. I will continue to practice, learn, study and listen to do the best I can to pay tribute to the greatest entertainer of all time, Elvis Presley! When asked about his dad, Ron Jr had this to say: My dad started late as well. He always had a nice Elvis sound. Born in Mississippi, and in his 60s, he was asked to perform for at a beauty pageant. He did great, and from there, he started doing a couple local shows a year. At 76, he is still at it! We are both performing together next week (August 16th, 2018) at Traversos Restaurant in Orland Park. Here is a pic of my Dad dressed up as Elvis only a few years ago! How many guys get to perform at 53, an Elvis tribute with their 76 year old dad?!? Feeling blessed!